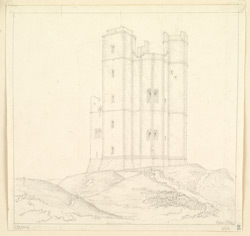 Drawing of the rear of the great keep of Orford Castle in Suffolk. This castle was built on the Suffolk coast on the orders of Henry II, to create a royal stronghold in the East Anglia region. It was completed quickly, being built between 1165-73. It is remarkable because of its polygonal keep, which was one of the first of this type. The idea behind it was that a polygonal keep was less easily undermined than a traditional keep. This one had an incredible 21 sides, was 90 ft tall and composed of 5 storeys. As this view shows it had three buttress turrets. Each contained rooms on all storeys including kitchens, a chapel, closet and prison cells.